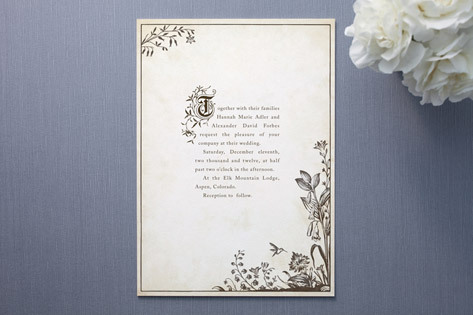 These oh so romantic wedding invites are perfect for fans of fairytales, romantic literature, and decorative books. Wonderful, detailed type and beautiful floral illustrations make this invitation a true standout, setting a fairytale mood for your special day. Available in winter cream/kahlua (shown) and ocean green/kahlua.